This sticker was designed by shellerocks, and is one of the first of our merchandise to be designed by one of our members. A very talented artist, shellerocks submitted an entry to a design request. 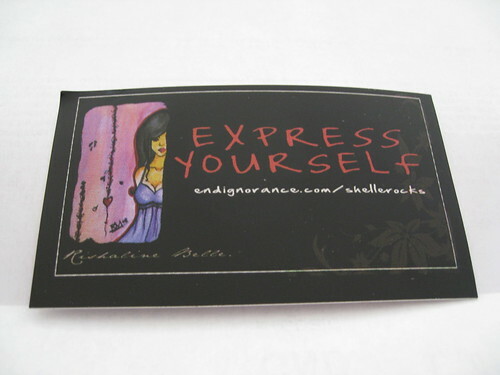 Her design featured the motto “Express Yourself” which sums up what endignorance.com is about. Allowing our members to express themselves using the talents they possess. By having the web address endignorance.com/shellerocks also featured on this sticker, it not only promotes the website which promotes the talents, but also the individual artist who designed it. The sticker features her very own personal touch. This sticker was designed by a member who believes the design should speak for itself and requested to remain anonymous. 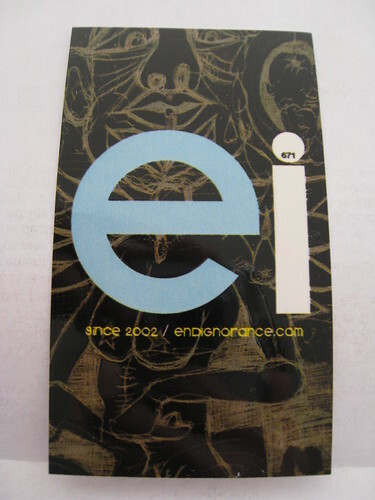 Description: Express Yourself and E.I. Since 2002.